Who is Playing “Mario Kart” On The Royals Video Board? Did you ever want to know what goes on at Kauffman Stadium when there isn’t a Kansas City Royals ball game? 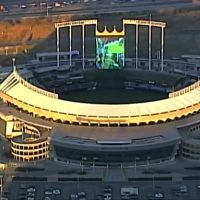 Check this out… A Kansas City’s news chopper was shooting some video of Kauffman and they noticed a game of “Mario Kart” being played on the giant Crown Vision video board. Who was the lucky person playing you ask? Turns out it was an auction item that someone won at a Royals fundraiser.